During the terrible war between Rama and Ravana, Indra appeared before Rama and said the gods were happy with Rama and he would grant any wish that Rama wanted. Rama said he was unhappy to see the destruction brought on Sugreeva's army and added that he wanted all the monkeys to be brought back to life. He also begged for the place of their dwelling to be always filled with trees and fruits. Indra agreed and sent his blessings on the battlefield where all the monkeys lay dead. One by one these monkeys regained their lives. The other monkeys were awestruck to see this miracle. 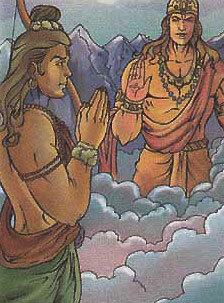 Then Indra and the other gods asked Rama to return to Ayodhya and accept its kingship. So Rama, Laxmana, and Sita bid a tearful goodbye and left for Ayodhya.